Responsible fisheries management is of increasing interest to the scientific community, resource managers, policy makers, stakeholders and the general public. Focusing solely on managing one species of fish stock at a time has become less of a viable option in addressing the problem. Incorporating more holistic considerations into fisheries management by addressing the trade-offs among the range of issues involved, such as ecological principles, legal mandates and the interests of stakeholders, will hopefully challenge and shift the perception that doing ecosystem-based fisheries management is unfeasible. Demonstrating that EBFM is in fact feasible will have widespread impact, both in US and international waters. 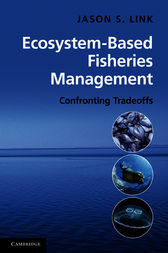 Using case studies, underlying philosophies and analytical approaches, this book brings together a range of interdisciplinary topics surrounding EBFM and considers these simultaneously, with an aim to provide tools for successful implementation and to further the debate on EBFM, ultimately hoping to foster enhanced living marine resource management.